Schizophrenia was 20th century psychiatry’s arch concept of madness. Yet for most of this period, schizophrenia was both problematic and contentious. This new history explores changes in the concept of schizophrenia across the 20th century. It provides a broad map of the concept’s mutating symptoms, fluctuating subtypes, social uses, and changing definitions. This research reveals and cites a long tradition of critical unease towards schizophrenia – by numerous mainstream psychiatrists, psychologists, and schizophrenia authorities. This critical stance is shown to have existed in addition to complaints by so-called anti-psychiatrists (also documented). The book therefore explains how and why North American Psychiatry eventually sought to stabilize its disease concept at an institutional level – through the use of operational definitions in its DSM series. Among its many remarkable offerings, the research unearths accounts of children being experimentally kept on LSD for over one year, and demonstrates that the stigmatising idea of schizophrenia as a split personality actually stems from Swiss Psychiatrist Eugen Bleuler – the concept’s creator. But its principle aim is to serve as a useful introduction to schizophrenia that guides the reader through a complex history of rejection, negotiation, and transformation, in this most contested of 20th century concepts. 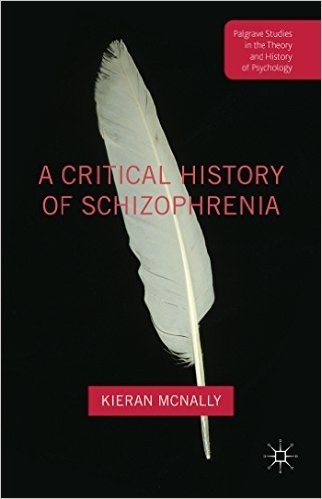 This historical contribution to our understanding of schizophrenia draws extensively on primary sources from the schizophrenia literature, and builds on the research of recent historians of psychiatry and related disciplines. Dr Kieran McNally is Adjunct Lecturer in Psychology at University College Dublin, and previously of the Institute of Psychiatry, London. He specialises in the history of Psychiatry, and is also the author of the ecological and social history, The Island Imagined by the Sea.